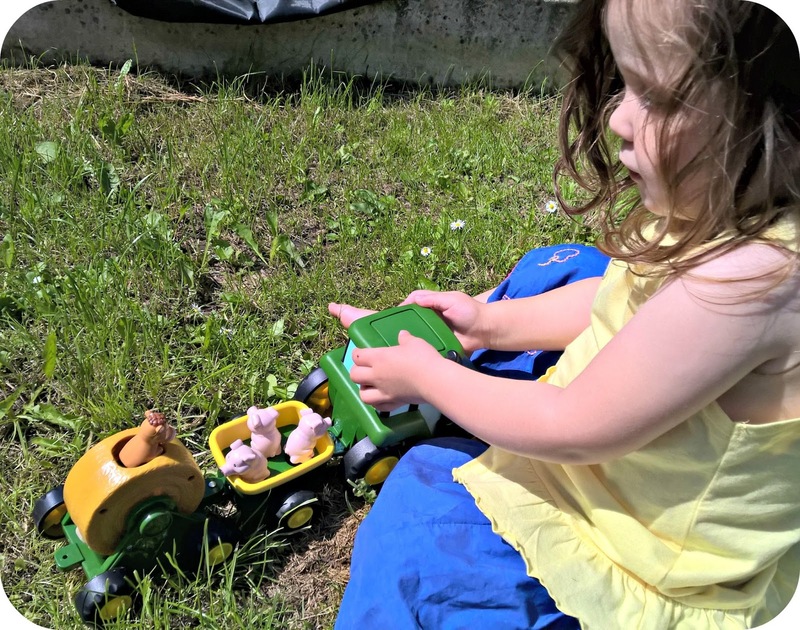 Farm toys have been popular in our house since Bud was tiny and began his love for animals and now LM wants to be exactly like her big brother she's a big fan of anything farmyard when choosing toys. When TOMY offered to send across the John Deere County Fair Wagon, from the Johnny Tractor and Friends range, for LM to try out I knew that the toy would be well received in our house. 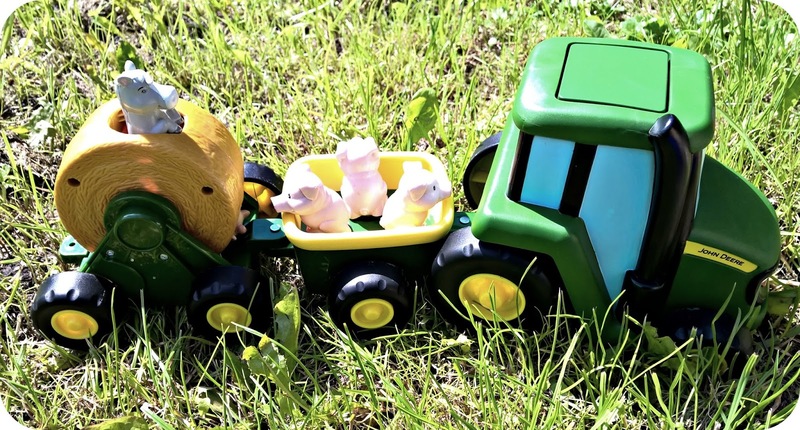 John Deere are an iconic British agricultural company and they have officially licensed TOMY to create a range of toys with their name, which means tractors of course! 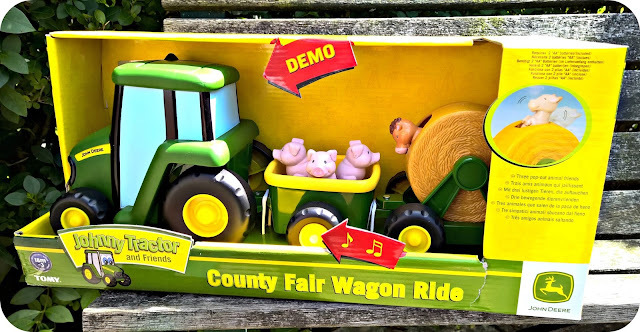 The County Fair Wagon sees a John Deere tractor pulling two trailers, one which transports three pigs, and one which features a hay baler with three surprises - a horse, cow and sheep pop their heads out - as it rotates. It's a push along toy and the wheels rotate freely. If you press the tractor roof then the toy plays a range of carnival and animal sounds. The tractor has a soft, rubberised covering which is perfect for little hands and LM has loved pushing this around the garden in the last few days. The little pigs jiggle around in their trailer and the rotating hay baler make it even more interesting. She's been a little frustrated that the animals can't be removed, especially the pigs but is now used to that and I don't think it has lessened her enjoyment of the toy. 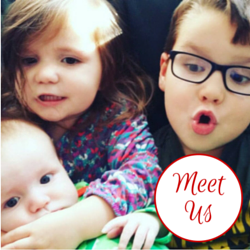 The toy is aimed at children from eighteen months to three years and LM, at two years, nine months is right in the middle of the age range. I think it's pitched perfectly at this age group and a great toy for little hands. I'm sure Little E will be a fan when he's a bit bigger and I've even caught Bud playing with this, he really liked that it was a John Deere tractor as, in my five year old's opinion, they are the best tractors! We've been using the toy to encourage LM with her knowledge of animals and the noises that they make and she loves pointing to each animal in turn, saying their name and making their sounds. She's also enjoyed 'driving' the tractor around the garden, stopping off at various points to turn the hay baler. 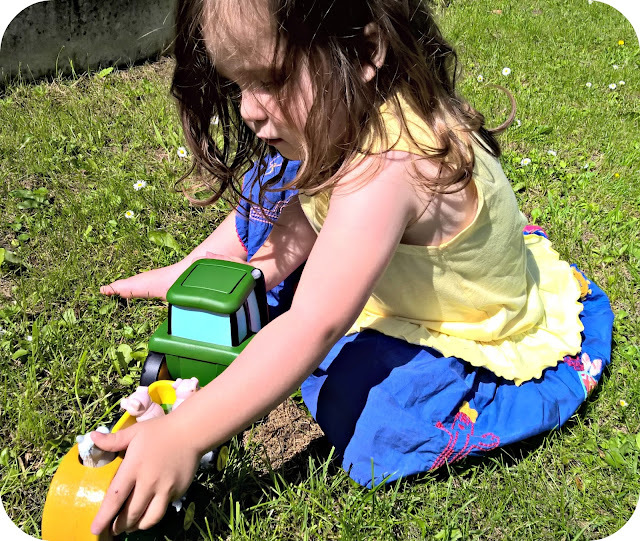 This is a really high quality toy and one that would entertain any child with an interest in wheeled or farm toys, It definitely gets the thumbs up from LM and the rest of us. The John Deere County Fair Wagon is available from all usual stockists, including Amazon, with an RRP of £25.